Jim Jarmusch is a Shakespeare fan, not just of the works themselves, but of the theories surrounding their authorship. He is not sure who wrote the plays and sonnets. Perhaps Edward De Vere, Earl of Oxford, the man immortalized by Rhys Ifans in Roland Emmerich’s 2011 drama Anonymous, or perhaps Christopher Marlowe. Whoever it was Jarmusch is certain that it wasn’t William Shakespeare. Jarmusch’s love of Shakespearean theory is what led him to write in Marlowe as best friend to Adam (Tom Hiddleston) and Eve (Tilda Swinton) in his new romantic drama Only Lovers Left Alive. Like the couple, Marlowe is a vampire. Hundreds of years after his supposed death, he is living the undead life in Tangier. More curious is that, according to the history books, the Elizabethan playwright was only 29 when he was murdered in 1593, but Jarmusch cast 74-year-old John Hurt to play him. “Because Marlowe’s death, the more I researched it, it seems totally faked,” Jarmusch says. “I don’t believe in Marlowe’s death, so another conspiracy comes to light. And Marlowe is a possibility, so in this version I’m going with the Marlowe theory. 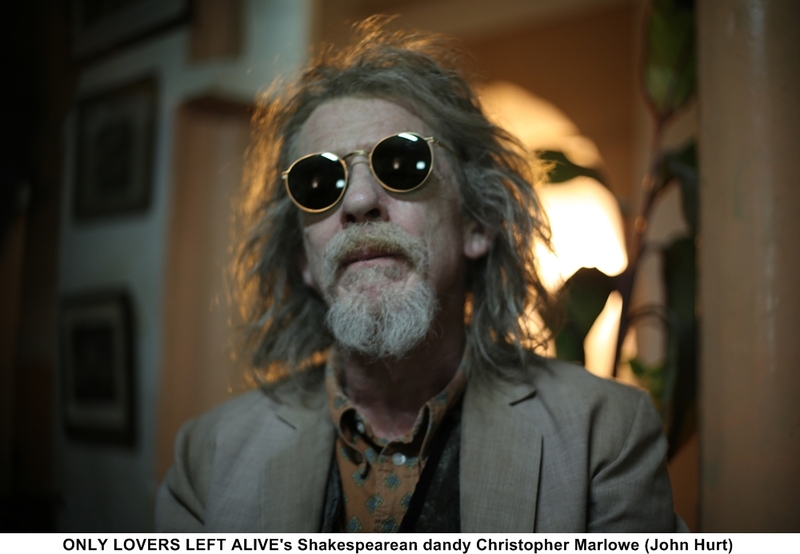 Only Lovers Left Alive may not convince the world that William Shakespeare didn’t write a thing and that it was Christopher Marlowe all along, but Jarmusch has made at least one convert: John Hurt.